Have you ever wondered what makes services like Apple Pay work? Square’s NFC Guide explains everything you need to know about Near Field Communication. 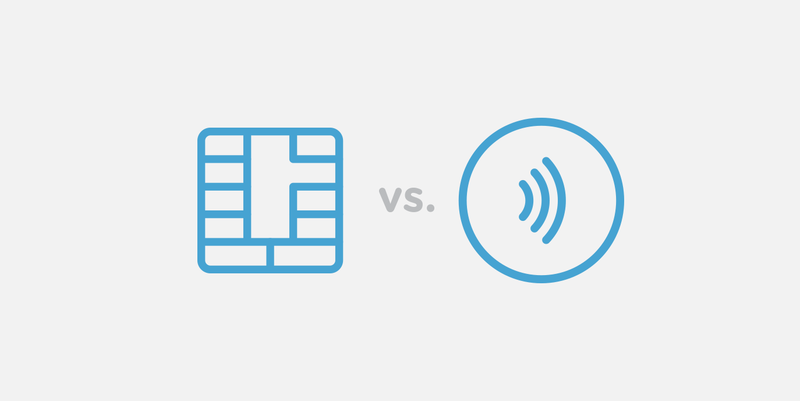 EMV and NFC: What’s the difference? Why should I accept NFC? How do you pay with NFC? How do you accept NFC? From email to personal banking to health apps, we’re increasingly using our mobile devices to manage our lives, so it’s no surprise that we’re buying our coffee with them too. We love the speed and convenience of NFC contactless cards—just tap and get on with your day. So it’s no wonder that NFC mobile payments—paying for stuff via your smartphone—are becoming increasingly popular. To help you accept contactless cards and mobile payments at your business, here’s a guide to NFC. NFC (near field communication) is the technology that allows two devices—like your card and a payments terminal—to talk to each other when they’re close together. NFC is the technology that enables contactless payments. What are some examples of NFC payments? The most prevalent example is the INTERAC Flash® debit card that you use in your day-to-day life. The buzziest NFC mobile payment types are Apple Pay and Android Pay. How do I accept NFC? You’ll need to get an NFC-enabled payments reader that can accept contactless payments. The Square contactless + chip reader accepts both NFC (contactless) and EMV (chip) payments. Are NFC point-of-sale systems expensive? Not necessarily. Some can be hundreds of dollars, but Square’s NFC reader is just $59. Yes. NFC mobile payments are dynamically encrypted, making them one of the most secure ways to pay. Plus, cardholders are protected from fraud for NFC transactions up to $100 with all major card brands. NFC (near field communication) is what enables devices and NFC-enabled cards to communicate wirelessly when they’re close together. NFC is actually a subset of something called RFID (radio-frequency identification), a technology that allows us to identify things through radio waves. RFID is nothing new—it’s been used for decades for things like scanning items in grocery stores and luggage on baggage claims. NFC, which was introduced in the early 2000s, uses a specific RFID frequency (13.56MHz, to be exact) for close-range communications. To date, some of the more common uses for NFC are identification cards to gain access to places like office buildings and transit cards for use on buses and metros. But increasingly, NFC is being used to power something called “contactless” payments. A contactless payment is a transaction that requires no physical contact between a device and a payments terminal. Meaning, customers can just hold their mobile devices or contactless cards near the terminal to pay. You’ve probably already seen a contactless payment in action—contactless cards are a way of life here in Canada. In an NFC payment, you tap or hover your device or card to pay. NFC is the technology that’s at play here—it’s the way the mobile device or contactless card and the NFC-enabled point-of-sale system talk back and forth to each other to process a payment. The devices do have to be close, though (that’s where the “near” part of near field communication comes in). For a contactless payment to work seamlessly, you usually have to hold your card or phone two inches or less from the reader. When a contactless payment is initiated (by a customer holding or tapping a card or mobile device to the payments terminal), the NFC technology goes to work. Using that specific frequency we talked about, the NFC-enabled reader and the device or card pass encrypted information back and forth to each other to complete the payment. This all takes just seconds. Speed, in fact, is one of the coolest parts of NFC payments. They take a fraction of the time of magstripe and chip card transactions—and are leagues faster than cash. A variety of different NFC-enabled payment solutions are available today. Almost all credit cards in Canada are equipped to be “contactless” or “tap to pay”, and the majority of debit cards are too. For iPhone users, there’s Apple Pay, while Android users have Android Pay. The idea of paying through a mobile device can make some people uneasy, especially because we’re so accustomed to keeping our wallets close to the vest (so to speak). But NFC payments are extremely secure. As opposed to the data on a magnetic-stripe card (which is static—it’s all right there on the back of your card), the data involved in an NFC transaction is encrypted and dynamic, meaning it’s constantly changing. So how does this work with mobile payment options? Mobile payments don’t actually store the credit card number of the device. Instead they use something called “tokenization”. Let’s look at Apple Pay as an example. After you take a picture of your credit card and load it into your iPhone (learn how to set up Apple Pay), Apple sends the details to your card’s issuing bank or network. The banks and networks then replace your bank details with a series of randomly generated numbers (the token). That random number is sent back to Apple, which then programs it into your phone. This means that the account details on your phone can’t be cloned into anything valuable to fraudsters. Anytime contactless pay is initiated, your phone sends temporary numbers to the point of sale that can only be used for that specific transaction. Then the number changes, and can’t be used again. NFC payments are encrypted and secure. EMV and NFC are often mentioned in the same conversations. That’s because they both represent the future of more secure, authenticated payments. However, they’re not interchangeable (a common mistake people make). EMV® — developed and managed by American Express, Discover, JCB, Mastercard, UnionPay and Visa — is actually a set of standards for payment cards and terminals. EMV has standards for both contact chip card technology, as well as contactless cards—also known as NFC (which stands for 'near field communication'). When people talk about EMV as a kind of payment, they’re often referencing EMV chip cards. A chip card is a super secure form of payment that encrypts bank information. Near field communication (NFC) is associated with contactless payments like INTERAC Flash® mobile payments like Apple Pay—basically, anything you tap to pay. It allows smartphones and other devices (like a payment reader) to communicate with each other when they’re close together, usually around two inches or less (that’s the “near” part). It isn’t a matter of using one or the other, though. Many consumers use both. And as long as your business is equipped with a suitable POS and reader you can take all payment methods your customers wish to use. Both EMV and NFC are ‘authenticated’ payments. 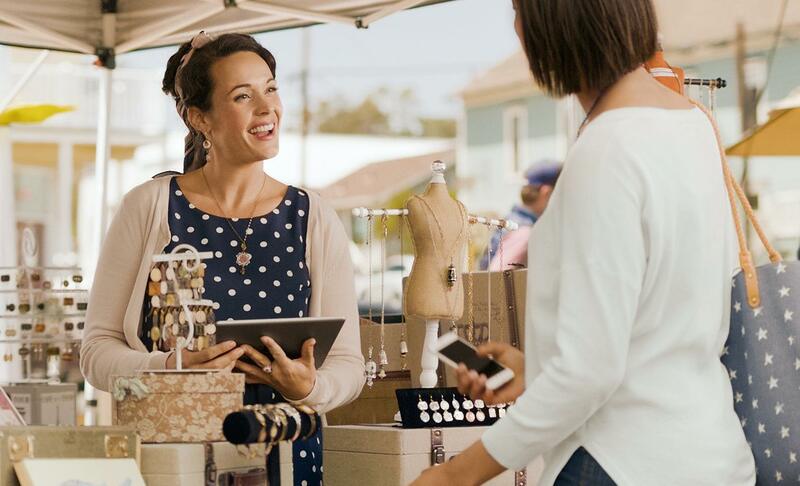 NFC-enabled payments are better for your business for three key reasons: they’re fast, convenient and secure. Let’s dive a little deeper. NFC transactions are the fastest way to pay—they take just seconds. And as people have started to realize that contactless is the faster, easier alternative, they’ve adopted the contactless way of life. The speed of NFC transactions is a huge plus for businesses. After all, fast transactions mean more sales. What’s easier than tapping your card or phone? When it comes to making a payment, not much. That’s one of the reasons why it’s the preferred payment type among Canadians—in fact, a recent survey found that more than 1 in 3 Canadians always or often use contactless cards. If you want to accept your customers’ favourite form of payment, NFC is the way to go. Contactless cards are protected by the same technology that secures a regular EMV chip card. Mobile wallets like Apple Pay tokenize your bank details, meaning they replace your information with algorithmically generated random numbers called tokens. These tokens then pass through the networks needed to process the payment, without exposing your actual bank details. What’s more, these tokens change every time an NFC transaction takes place—so the data is nearly impossible to isolate and extract. NFC payments like Apple Pay are also locked down by the fingerprint technology built into the iPhone (you initiate an Apple Pay payment with Touch ID). Fraudsters may be tricky, but they can’t replicate your fingerprint. It’s worth familiarizing yourself with how to pay with NFC as a customer. It’ll help you troubleshoot any issues your customers might have when they go to pay with their device. Plus, it’s good to be up to speed on where the payments industry is headed. You’re probably already familiar with how to pay using a contactless debit card. Just hold your card a couple inches away from the reader and your payment will be processed in a few seconds. 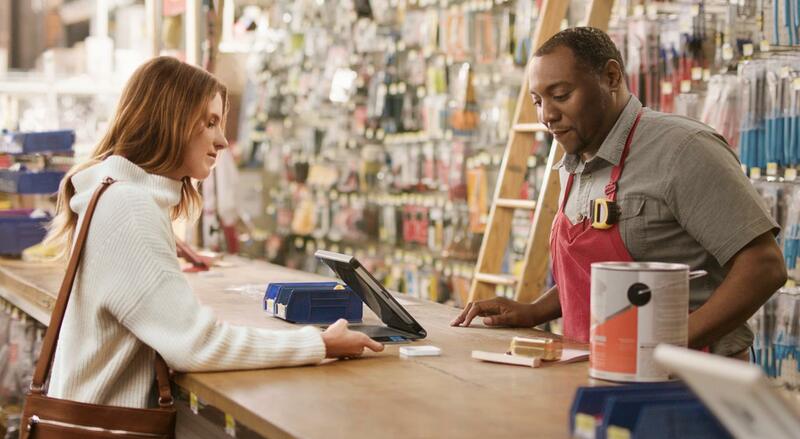 To accept NFC mobile payments at your business, you’ll need to get set up with an NFC-enabled reader. But this doesn’t have to cost you an arm and a leg. The Square contactless and chip reader accepts both EMV and NFC payments and is just $59.